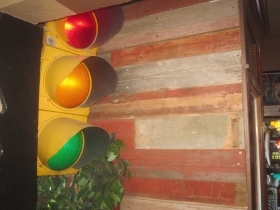 Many old Milwaukee touches in campy, gay-themed restaurant, bar and arcade. Hamburger Mary’s. Photo by Michael Horne. In this great melting pot of a nation, a group can be considered assimilated once its restaurants become part of a national chain. In the afterglow of Mexican Independence Day, let us reflect that a Harris Poll survey of 77,000 people released last week concluded that Taco Bell is the best Mexican restaurant in America. And the Olive Garden has taken Italian cuisine to places unimaginable in that nation itself. 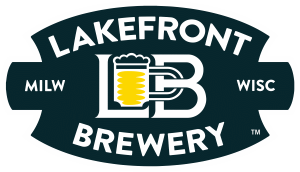 The Milwaukee outlet opened in 2011 in Bay View, at the northern end of S. Kinnickinnic Ave. It was located in a nondescript building that appeared to date to the 1960s, and was surrounded by parking lots. The building, which had been vacant since Hamburger Mary’s moved to its current location in Walker’s Point in late 2016, has been demolished for the construction of a six-story apartment building with retail below. Hamburger Mary’s occupies a significant parcel at the northeast corner of S. 5th St. and W. National Ave. in a complex of three buildings that had served as the home of La Perla, a Mexican-themed (but not Mexican-owned) restaurant that was an early pioneer in the area. 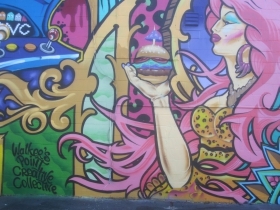 It closed in July, 2016 after 21 years in business, and the owners, Nick Anton and his wife JoAnne Anton sold the property and fixtures to Brandon A. Wright and his twin brother Ashley B. Wright, who own the Hamburger Mary’s franchise in Chicago. After some remodeling (a giant chili pepper remains), the new location opened for business in November, 2016. Since then, the once desolate stretch of road has been transformed into a vital urban space in a remarkably short period of time. The restaurant/tavern occupies three buildings and has 6,295 square feet of floor space, which makes it among the largest such establishments we have visited. Additionally, customers have their choice of decks in clement weather. Choose from one with a fireplace facing busy W. National Ave., or climb the stairs at the north end of the complex, and head up to the roof, overlooking a newly busy S. 5th St. from atop the one-story cinderblock industrial structure at 730 S. 5th St. built in 1947 on the site of what had been a couple of frame houses. The other two buildings, at 734 S. 5th St. and 438 W. National Ave. are of greater architectural interest, and date to the 1870s. The National Avenue building has a cut-out corner entrance which in this part of town is usually a sure sign that it had been constructed as a tavern. But not in this case. This was built in 1877 by William Ritmeier as a pharmacy, and served in that role for a century from this structure. Enter through the door, if it is open, and you will find yourself in a tall-ceilinged room with large windows and a tin ceiling that is likely original, as are the burnished maple floors. Hanging overhead are chandeliers, no two of which appear to be the same, enhancing the garage-sale nature of the decor. The bar runs the length of the north wall. 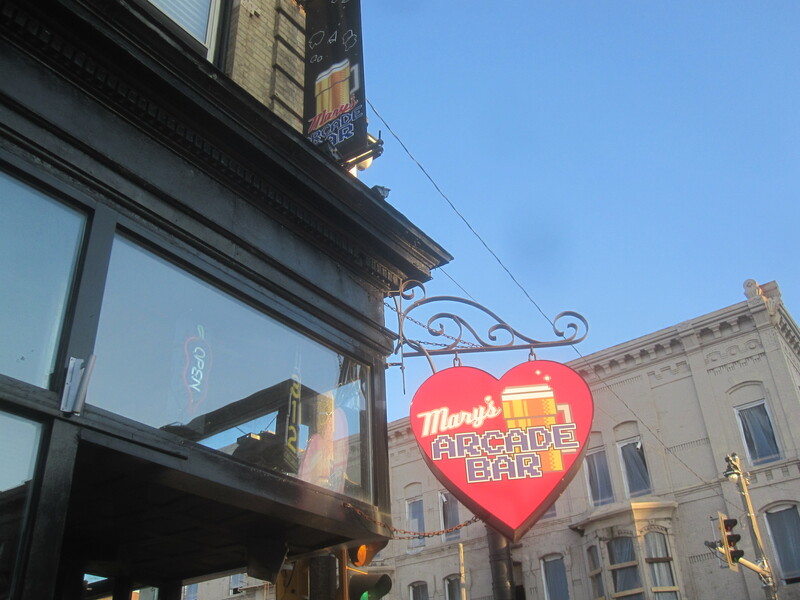 This area is called Mary’s Arcade Bar, (also known as Mary’s Beercade) and has a number of amusement devices, some of which are free. It is the most conventional space in the building, and has a couple of tables for seating. It features craft beers and broadcasts sporting events. The tables are finished with a coating of beer caps, encased in polyurethane. 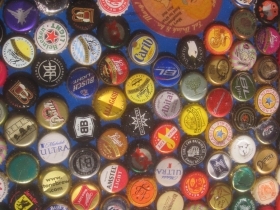 It looks like a Milwaukee bar, and drinks like it, too, with a nice array of craft beers. 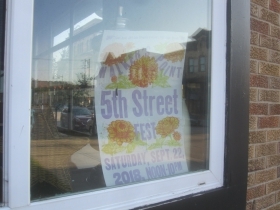 Head to the north, and you will enter the 734 S. 5th St. building, also an old storefront structure. If the corner entrance to the arcade is closed, this is the way into the place. Note the exterior, which is authentic right down to the ancient mail slot. Here the effect is more of the living room nature, with a television screen and more amusement devices, in addition to lounge seating and old fashioned board games. Beyond that is a dark room with a dart board. Along the corridor are two gender-neutral bathrooms. Finally, there is Hamburger Mary’s itself, more of a restaurant space, but with its own bar. Events can be held all over the complex, and this bar has an active social calendar with such standbys as Trivia and Packer’s game day specials. Perhaps “Maryoke” is for you. There is also regular HamBingo for charity, with a different cause each week. (You pay to compete for prizes donated by the charity.) It is hosted by Dear Ruthie and Karen Valentine. 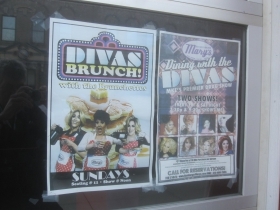 Fridays and Saturdays bring “Dining with the Divas,” a popular drag show. For those who can arise by the next afternoon, there is a Sunday Diva’s Brunch. The place opens early — usually when a gay club says it opens at 11:30 you’d imagine it to be P.M., but Hamburger Mary’s is ready for business a half-hour before noon. Of course there is no way I can put on a face and adjust my wig that early! Location: Hamburger Mary’s: 730-34 S. 5th St.; Mary’s Arcade: 438 W. National Ave. 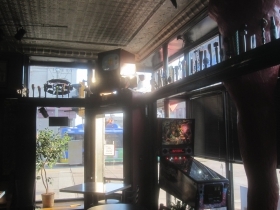 Description: A large establishment in three connected buildings, two quite historic, is a campy, gay-themed restaurant, bar and arcade with outdoor decks in back and above. Estimated Annual Rent: Annual rent for the 6,295 sq. ft. licensed premises is estimated at $112,086 by the City Assessor. Affiliate of operator owns building. Property Assessment: 730 S. 5th St.: The 11,250 s.f. lot is assessed at $90,000 [$8/sq.ft.] The 3,600 sq. ft. building is assessed at $515,000 for a total assessed valuation of $605,000. 734 S. 5th St. and 438 W. National Ave. are one building for assessment purposes. The 4,850 sq. ft. land is assessed at $38,800 [$8/sq.ft.] and the 5,477 sq. ft. building is assessed at 492,200 for a total assessed valuation of $531,000. Affiliate of operator purchased properties for $1,400,000 on April 24th, 2018.